There's little doubt that the 1980's were the Golden Age of Heavy Metal. Since that era, many newer bands having been trying to reach the standard of excellence the forefathers of the 80's did. And for the most part, they have failed. But to be fair, many of those classic bands have also fallen far from their glory years (Metallica, anyone?). 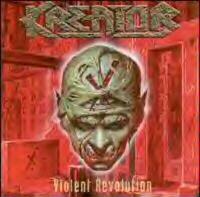 That's what makes Kreator's "Violent Revolution" such an inspiring release. For on this record, one of the legendary 80's thrash bands not only recaptures the fires of their heyday, they actually managed to improve on their winning formula. This is an awesome release full of high speed aggression but also superb musicianship and clever musical ideas. It recalls almost all aspects of Kreator's past (excluding the muddy mayhem of their debut "Endless Pain") and merges them into a seamless whole. Mille Petrozza's vocals have returned to the raspy shouting of old (with rare exceptions) and the lead guitar work of both he and Sami Yli-Sirnio is faultless, conjuring up memorable melodies even in the midst of a raging thrash attack. Some tracks like "Replicas of Life" and "All of the Same Blood" are more musically advanced than anything Kreator has done before. They have not abandoned the experimental nature of their more recent releases, but they've sure combined it with the power and energy of classic efforts like "Coma of Souls" and "Extreme Aggression". The record starts strong and actually manages to pick up steam as it rolls along. Metallica, Megadeth and even Slayer itself can learn a lot from this record. It's the best "comeback" album I've heard by an 80's stalwart and one of 2001's most powerful metal releases. A strong opening track, definitely like something that could have come off of "Coma of Souls", it's great to hear Mille rasping away again. The cut ranges from mid-paced to frantic and features cool lead work. Things only get better from here. A brief instrumental with an ominous tone, it sets the stage for the next number. The title track comes across as a mid-paced anthem, with a catchy chorus. It has a sizable amount of groove to it, but not in the same way that modern nu metal bands have. It could have been written about 1987. This is not a bad track but possibly the weakest one on show here. The first of the album's epics, it's hard to believe they can pack so much into a track only slightly more than six minutes long. It starts out fast and thrashing, with very precise picking, slows down into a more melodic phase with harmony guitar and then gradually returns to a powerful thrash attack. Awesome lead soloing is a highlight. This is a great track! This is a slower and more moody piece, with a feeling reminiscent of the recent "Endorama" album. But it's heavier and grows on the listener. An involved chorus and strong drumming from the veteran Ventor help a lot. This is absolutely textbook Kreator. I can't think of a song that sums up their musical approach better than this. A crunching slow build up explodes into some classic thrash riffing that typifies the band. It is simply superb! This may be the heaviest track on the album. Another mid-paced stomper, it features some memorable down-tempo guitar melodies that are hard to forget. This one is an unusual combination of melancholy and metal thunder. This is probably the single best track Kreator has ever written. It starts mellow and melodic, with Mille singing in the lower register he used on "Endorama" -very Gothic. Then a whirlwind blitzkrieg of high speed thrash kicks in, with Mille sounding extremely angry. Lots of great twin guitar melodies predominate and the lead work sets a high, HIGH standard. This is a killer number..."Live In Fear and Die In Pain"! A more straightforward thrash cut, this is sure to get the neck sore. The chugging riffs sound pretty modern, but brought up to Kreator standard. This one kicks things up a notch on the speed meter. The track is fast and furious but not ignoring melody. A good change of pace, this is simpler and less involved than most of the other tracks. It's what the band SHOULD have sounded like on "Outcast". This is very catchy and the lyrics are great: "Mind on fire, Holy drug of kings and queens, like a cancer on the face of desire, for reality is not what it seems, and the rules were written down by a liar." Pure Kreator thrash ends the album. There's some weird Gothic vocals towards the end I could have done without. A cut that would have been the highlight of any of their albums in the last decade, it's probably one of the most typical songs on "Violent Revolution", which gives you an idea of how strong the album is.